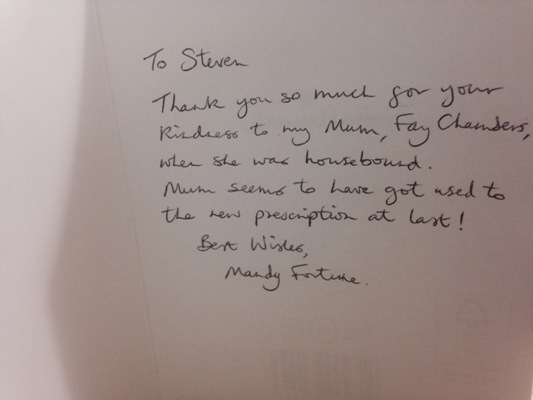 Steven Downton, dispensing supervisor, received a thank you card from Mandy Future after he gave up two lunch times to help her housebound mother, Faye Chambers, a customer of the store. Mrs Chambers had noticed that something wasn’t quite right with her most recent prescription, but being housebound she was unable to go in store to have them altered. After hearing about this, Steven selflessly gave up his lunch time to visit her at her home and made a few alterations to Faye’s glasses. Steven received a thank you card praising the fantastic service from the store.